← What is practical graphic design sense? There is more to graphic design than creating a beautiful layout. One of the most important aspects affecting your final piece is how the document folds. In the world of printing, you will often hear the fold referred to as a “finishing” option. The type and thickness of paper and the type of fold need to be determined prior to creating the layout. If a thick cover paper is used, the layout will need to be adjusted so that the document folds correctly. For example, the inside panels will have to be adjusted 1/32″ to 1/8″ to accommodate the thickness of the paper and the fold itself. This is called nesting. Gate fold (or window fold): In a gatefold, both the left and right edges fold inward with parallel folds and meet in the middle of the sheet of paper without overlapping. Double gate fold: Using the gate fold as described above, the paper is then folded again down the middle so that the folded edges meet and a fold is created in center. Accordian fold: An accordion fold is a simple tri-fold, but the two outer panels zig-zag in opposite directions. This is also referred to as a “Z” fold, a zig-zag fold or a concertina fold. Half-Accordian fold: A variation on the Accordian fold where one panel is half the size of the other two. Engineering fold: Similar to the half-accordian fold, but in this case one panel is twice the size of the other two. C-Fold: This is the official name of the typical tri-fold often used on brochures and letters. 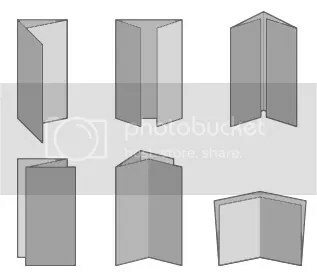 C-folds have 6 panels with two parallel folds. Common names used for this fold are letter-fold, tri-fold, and a brochure fold. Spiral fold: Similar to a C-fold, but instead creating more than 6-panels. The panels fold into themselves forming a spiral. This is often referred to as a barrel fold, a wrap fold or a roll fold. Double Parallel fold: In this fold, the paper is folded in half, and then in half a second time. The second fold is parallel to the first. This is also called a double fold. Cross fold: Cross folds have two folds going in different directions, forming 8 even panels. Often used in bookmaking, this type of fold is cut to form signatures. This is referred to as a French fold, quarter fold, or a right-angle fold. Half fold: The simplest of all folds – basically folding a sheet of paper in half forming four panels. This is often called a single fold.